I have more than just wild boar recipes, check out more recipes at the end of the page. You've found my favorite wild boar recipes. The following is a wonderful wild pig recipe and will soon become a family favorite. Spray a large crock pot with vegetable oil and add the roast. Whisk the remaining ingredients together and pour over the top. Cover, and cook on low until the meat shreds easily with a fork, about 7 hours; 8 to 10 hours on high if frozen. If you find that the meat is dry, add more of the beef broth. Shred, and serve on toasted rolls with homemade mayonnaise, slice of provolone cheese and coleslaw. Wild boar meat is leaner, so you want to make sure to baste the ham often when it's cooking. Baking at 325 degrees should be the highest temperature or it will dry out. Low and slow will guarantee a wonderful result. Place the ham in a shallow roasting pan and baste with the cola. 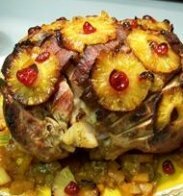 Using toothpicks, stick the pineapple rings over the top and sides of the ham. Sprinkle the brown sugar over the pineapple. Place the cherries on top (in the middle of the pineapple rings). Stick a few cloves in the pineapple rings - securing all with toothpicks. Cover with foil and bake 30 minutes per pound, or until the internal temperature reaches 140 degrees. Baste with cola every 30 minutes during cooking time. This raisin sauce is good over baked ham. Combine sugar, cornstarch and salt in a saucepan; add broth (or water) and bring to a boil - stirring constantly. Add raisins, orange juice, lemon juice and butter. Simmer for 5 minutes. Keep warm in a double boiler. Do not refrigerate, freeze or reheat. Serve over slices of baked ham. Serves 6. Here's another one of my excellent wild boar recipes. This wild boar sausage is great for breakfast. Combine all seasonings. Mix the seasonings into the chilled meat and then put through the grinder with a 1/8 inch cutting plate. Mix meat and fat in a bowl and add just enough water to make a soft "dough." Stuff into casings and take care to avoid air bubbles. PREHEAT grill and spray grates with oil. Cut boar tenderloins and vegetables into pieces and rub with all with canola oil. Skewer boar, followed by onion, pepper and squash; repeat three times on each skewer. Season with the garlic and onion powder, salt and pepper to taste. Place on hot grill. Keep moving kabobs so they don't burn. If browning too much, turn down grill. Cook until boar reaches internal temperature of 165 degrees. Baste with barbecue sauce just before removing from grill. You may also use my homemade marinade recipes, if you wish. They are excellent for beef too. This is one of those "make it and forget it" kind of wild boar recipes. Just place in your crock pot, turn it on, and it will be ready that night. This does need to cook 10 - to 12 hours, so you may want to do this overnight. Cut all visible fat away and place in the bottom of the crock pot. Poke holes throughout the roast and pour 1/2 cup cola over the roast and set on low for 12 hours. Remove cooked roast and drain liquid. Shred the roast and return to the slow cooker. Add the barbecue sauce and remaining cola. Cook for another 5 hours - A MUST. It is wonderful, and well worth the wait. Make into sandwiches and top with coleslaw.